"Speed, Flexibility and Business Empowerment Tool"
Vinyl's speed to deploy really amazed our business. We went from a rough concept to Pilot program very quickly (weeks). It was flexible enough to meet all of our business requirements and we were able to gain efficiency that saved us time and resources along the way. Buy in and involvement from the Business up front is key. This can be very difficult but will pay dividends in the long run. Customized user guides would also be beneficial. Vinyl solved two main problems for us; Capacity and resourcing. Originally, we used an outdated platform that had limited scalability, flexibility and required our IT department involvement to run the day to day business. Once the full transition to Vinyl was completed, we were able to increase our output with 1/2 of the resources (none IT) in the same amount of time. This platform empowered the business to meet and exceed customers expectation without requiring the usual drawn out IT processes and implementation. We are now working to implementing this tool across our full business unit. Vinyl makes it incredibly easy to translate business requirements into a functional application. Implementations and iterations happen quickly compared to other development platforms which enables me to react quickly to changing business needs. As a former front end developer, I've found that my go-to toolbox of UI tricks are not necessarily the right way to implement styling changes. That said, the application has made it incredibly easy to customize the client side appearance without requiring me to decipher thousands of lines of CSS. Product processing seems to be one business problem that arises fairly often for my team. Using Vinyl, we can create an application in a matter of days which is custom tailored to a specific process instead of bending a process around the limitations of an existing application. Additionally, because Vinyl allows us to integrate seamlessly with multiple and varied legacy systems, we can better focus on the actual business problem. What No-Code Development Platforms solution do you use? "Vinyl can be used to build both big and small applications." Easy to use. Easy to build. Easy to deploy. Build applications from the ground up in days instead of months. Leverage existing data or start from scratch. This tool allows me to build solutions. I do not waste time debugging code. Documentation within the tool could be more robust. Contact the company and ask about their POC (Proof of Concept) offer. They will build a small real world application based on a business issue of yours that you help define. You get to see how fast and easy it is to build things in vinyl. Using vinyl to build new front end against old data. Easiest and fastest way to get business users the tools and features they need to do their job. Retire old applications one at a time instead of trying to rewrite everything all at once. Vinyl is very iterative. We sit with the business for a few hours and get the high level overview of what the issue is. We spend a day or two building the prototype and come back and show the business the result. This spurs conversation and we take another day or two to incorporate those changes. Rinse and repeat. You get buy-in from the business because they are involved in the process. Myself and our company are relatively new to Vinyl, but with moderate exposure and minimal knowledge, i can see the full potential this product has to enable us to digitally transform our business. It's easily accessible, highly customizable by users who are not developers and agile. What I like best is that it's EASY to use. It's clean, consistent and the IDE is not too complex. This can enable those who don't have a strong developer background to be successful. And the Zudy team have talented individuals who continue to improve it. I can see how in some cases or for some businesses, the look and feel can be "too simple." However, I have not had a lot of exposure to the "cosmetic" side of app designing. We're giving users a better opportunity to access data without having to VPN in, utilize remote desktop connection and wait for a clunky ERP to load. Employee satisfaction is a significant benefit from using Vinyl. As we continue to build more apps, the benefits will continue to grow. In my experience, I really appreciate Vinyl's ability to connect to multiple sources and consolidate the information in a succinct and valuable manner. I also appreciate accessing Vinyl via a web browser, and hence it's platform flexibility. The API integration is very helpful when interfacing with numerous other applications and extracting information for consumption. Leveraging HTML, CSS, and other formatting options, the possibilities are endless in regards to the look and feel of Vinyl, which is great for customers. Vinyl can be highly customized and personalized down to the user. Avoiding the need to code is not just less troublesome, it is also makes development a lot quicker, which is of utmost importance for customers who's time is of utmost importance. And all customers want a quick turn around, in my experience. There are two major functions I believe would make the usability and overall perceived and realized value of Vinyl increase: a better visual representation of the sql processes (tables, joins, etc.) and the ability to input raw sql code and have Vinyl build DO's, sub Qs, etc. These are small request compared to what I can already do. The possibilities seem endless, and it can be overwhelming, but starting with a solid framework and building on top of it is important. As a developer, I have been solving many different types of problems including order review and tracking, scheduled workflow emails, customer management, business intel, and scheduling to name a few. I anticipate and hope to leverage the platform to perform other tasks like automated ordering, inventory management, and more complicated workforce management. "Exciting And Low-Profile Way To Bind Systems Together"
VINYL sits in our network on a very small environment, and it doesn't require a lot of infrastructure. Almost everything it needs sits on its own server, and it just works. It talks to all our other systems and brings their data into one place, where we can do almost anything we want with it. VINYL has an awkward initial interface. Once you've learned it, it's pretty easy, but guessing what some of the terms in the IDE mean can be really hard. Are you looking to get data from a bunch of different systems into one view for your users? VINYL seems to thrive in the space where there are either two systems, neither of which can be made to talk directly to the other, or if there are multiple systems, and users need information from all of them, but don't need or shouldn't have access to the source systems. We're combining a bunch of different systems to cross-reference the data in them, and provide a single view to our users. We've also been able to start storing entirely new data in the system as well. Vinyl provides a key "glue" to connect other commercial systems that are customized for a particular type of users, but are required for another type of user. "On demand reporting where previously was never possible"
After receiving some training, I am able to create my own custom reports without any specific programming knowledge. The more I use it and understand it, the more opportunities seem available. We are able to combine data from multiple sources in order to accurately display our sales and costs by customer in real time. In situations where we did not have the information available in any system, Vinyl has been able to store it for us, allowing us to easily forecast our net margin over future months. As well, in many instances, we have caught user errors quickly by using Vinyl. In some cases when comparing the data Vinyl pulls in automatically to that provided by users, and in other cases we see quickly when the reports we have in Vinyl don't make sense, that there was an error made in someone's manual entry. "Quick and Innovative solutions that improves daily processes....."
I manage the Vinyl portfolio at my company and I have grown to become very impressed with the quickness of implementations, quality of applications and the attentive customer service from the Zudy project team. The numerous applications we have implemented has proven to enhance the quality of work and improve efficiencies, which are key results from automating operational processes and reducing resource hours and efforts. It helps that the Zudy team follows a standard process for implementing projects, enhancements and quick fixes. This has allowed us to hit our timeline in an efficient way and ensure transparency with those involved. Financially, the implementations are pretty costly but you would have to consider the quality of work produced and improvements made overtime. I would recommend an ROI analysis to ensure you're getting the "bang for your buck". In addition too, the Vinyl implementations have questioned our internal abilities to deliver quick and quality products within our own IT Department. It's pretty difficult to compare "apples to oranges" / "no-code apps to configurable apps" so it's necessary to explain the difference often. This is an opportunity to learn from Zudy and implement some best practices. What business problems are we not solving! We are nearing two years since we have collaborated with Zudy. Since then, we have implemented about 10 applications along with many improvements and quick fixes. As time goes on, more and more business users learn about "Vinyl" and/or "Zudy", they hear about the amazing work delivered and the improvements our internal and external customers experienced. We are seeing many benefits across multiple departments – people are catching on and want a piece of it. I like how incredibly easy it is to view different endorsements in Vinyl. The grid that shows all of the different endorsements for any given week on a list makes monitoring a jock's endorsement schedule a breeze. I also love how Vinyl will notify me when someone has entered in an endorsement that is waiting for my approval. I'm a very busy person, and having notifications letting me know that there is something new to review is extremely helpful. I don't like how as someone not involved in sales, I cannot enter in or edit any of the fields for a campaign myself. It can be a challenge to get some AE's to actually use it in general. I'm the type of person who just likes to take charge and make sure things get done myself, so that aspect is a little bit frustrating. But otherwise, I love everything else about it. Go for it if you are looking for an easy to use platform that really helps you keep tabs on data! iHeartMedia uses Vinyl to keep track of jock endorsements. It's all kept together in an easy to read calendar and list, and helps us to make sure that everything a jock is doing endorsement wise is kept track of and it readily available to everyone in our nationwide company. It's so easy to manage this with Vinyl because of all of the easy and user friendly calendar options for keeping track of this stuff. "Simple and powerful - the possibilities are endless with VINYL"
I love the simplicity of the interface - everything is themed similarly and you always know that clicking on a "cog" icon, for example, will let you into the inner-workings of the element you are designing. As far as the need that the software addresses - it truly opens the door to any number of potential solutions for a company. If you've ever wished that your stock enterprise system came with a certain feature out-of-the-box, you now have the power to create it yourself with almost no coding required. VINYL accomplishes this and so much more with the ability to join data from your different systems (and web APIs) and create sleek and simple apps for your users (or customers) to use. Getting to know and understand the VINYL glossary takes some time - there are a lot of working pieces and layers to the software, and understanding how they all relate to each other (and what their counterparts are in your everyday working world are) takes a little getting used to. There also wasn't much of a "Help" section or any kind of references to help would-be app designers (from what I could see). They may exist somewhere, but I couldn't find them. We have been trying to accept ACH payments from our customers to avoid paying credit card fees, but our enterprise Point-of-Sale system couldn't handle it. We were able to put together an app that securely transfers funds from a third-party ACH clearinghouse and spits out a report in a format that allows us to easily post the payments to the customer's account, all while providing in-depth information about the customer as to how much money is owed - something that we would normally need 3-4 open windows to accomplish with our POS system alone. The app is in its infancy, but we're hoping the ability to pay via ACH (along with a little incentive) will cut down on the amount of credit card fees we pay and ultimately make things more convenient for our customers. "Extremely Powerful App Dev Platform"
Vinyl is very easy to integrate with many different systems and API's. Developing with Vinyl allows you to be creative because you are always finding different ways to accomplish what you need to do. With the latest UI/UX changes it has become even easier to learn and use Vinyl. The support team for Vinyl is excellent as well. For those who do not have a relational database background, I think it would be helpful if Vinyl offered tips to users while building out their applications. For instance, calling out missing indexes and long running queries could help novice users tune their applications much quicker. Just a few hours with Vinyl will give you the ability to see the power and versatility it has. Using Vinyl I am able to solve numerous business problems along with keeping development costs at a minimum. "Incredibly powerful and easy to work with"
The ability to code without coding allowed me to quickly learn the platform without learning a completely new language. Additionally, the light integration capabilities of Vinyl allows developers to connect to different systems and platforms brings data together in one easy to use and intuitive interface. To date, there is nothing that I dislike about Vinyl. Vinyl removes business technology problems. Being able to quickly provide a scaleable, customizable web application tailored for a business process has proven to be an invaluable, robust tool. Pre-existing business data is leveraged to its fullest extent given the light integration that Vinyl provides. I like that there is a system that can house all endorsements rather than individual personal spreadsheets. Make it easier when orders are coming down very quickly and jocks need to be assigned to campaigns. I think the system is very difficult to navigate and it's hard to search for things that ran/are currently running. Sometimes you will create a new search and nothing will populate even though the endorsement is in fact in the system. Being able to hold people more accountable for things since everything needs to go through the system first. However, we have been experiencing orders being sent down without endorsements being submitted through the tool so sometimes it works backwards (not a system issue, more of a communication issue) I feel like there was no proper training on the tool so people are confused. "Quickly created app that helped with business process." It is easy to make changes to Vinyl which makes the application development process iterative and agile. We used Vinyl to assist with a business process that hand not been formally defined. We made several iterations to the original application as we defined the business process it was automating. I have no major dislikes of the platform. We were able to create a solution in a timely manner and implement. At the begging stage of development create an application that performs the basic functionality of your intended solution. As you complete the fundamentals, add on enhancements such as validations, workflow, conditional formatting, etc. We used Vinyl to create an inventory management system for our live events business. "Run your business the way that works for you"
VINYL combines the best parts of a sandbox environment and a structured application infrastructure. Because of its open-ended nature, it's easy for enterprises to run a variety of backoffice processes in a single platform, without having to conform to the process constraints of something that was only built to specifically serve one or two functions. But unlike many other open solutions that require you to know how to play with the backend coding to customize the platform, VINYL allows you to change those features within the platform itself, making it more accessible to more people. Not much. Every now and then, some of the open-endedness can seem overwhelming, but there are resources in place to help manage and navigate. This is great for a company that has a large team, especially with multiple locations or divisions. VINYL makes it easier to go through the process of employee management, payroll, etc. Rather than having different platforms for, say, hours vs expenses, there is now one convenient place to organize and calculate everything. "Spend More Time Focusing on the Solution - Not Developing"
To build a solution in the enterprise IT world, you often need the right tools, people, time, and money. Vinyl has eased the load across all of these areas. Compared to enterprise platforms of the past; it is versatile, easy to learn, and it requires fewer people to build more applications. Adoption rate is high by the business since we focus our Vinyl solutions around their needs. Their input is taken into account up front and they see results immediately. For a long time I follow the triangle law of designers and project managers that "Clients can only choose two options between Good, Fast, or Cheap but can never have it all". Vinyl has destroyed this "law". Better, faster, cheaper is the new reality. A specific example: One of our customers brought two groups together to give input and estimates on a solution involving creating a dashboard around an existing system. The group that owns the existing system gave a 7 week timeline. We estimated 24 hours of effort using Vinyl. Everyone thought it was an underestimation or even a joke at first but it was delivered in under 24 hours.... following this, the same scenario occurred two more times in the same year with the same customer. It has spoiled our customers' business users. They expect their other tools, vendors, and even their own IT department to be just as flexible and fast. The hardest thing to overcome are your old habits. Let the business drive the solution. Their problems will define the requirements as you guide. Stay light and agile. Demand things to happen fast. We look across the business, find the inefficiencies. Apply a Vinyl solution. Save time. Save money. Repeat. We have solved problems around Finance, Inventory, PLM, HR, Procurement, Legal, Compliance, Event Management, Sales and Distribution, Asset Management. "Versatile & Agile Development to quickly meet business needs"
Great tool for champions in business to build tools that magnify the workforce and provide return for the company. With Vinyl, I have built tools to reduce poor communication through email and integrate data to do much more than is possible on any of our stand-alone systems. Working heavy in excel to manipulate data, an import tool to import data and automatically create a table based on the headers and inclusive of the data would be great. Building processes from MS Excel or Access is easy. Understand how tables are built and complete the basic training made available to those administrators. Leverage databases for their data to make your workflows more powerful in these workflows. We are integrating data from SAP, timeclock systems, and internal applications to accelerate business processes and improve accuracy by eliminating redundancy in communication. "Vinyl lets you code without coding - quick wins without learning a language"
Also like how the platform is constantly evolving and getting more and more nimble, offering great support throughout the process. Really excited about integrating it with Salesforce as I feel it's a lot more consumer friendly! If anything, because there isn't any actual coding that goes around with it, there is slightly less flexibility than what coding would allow. But, that's more than made up for by what is offered when it comes to speed of development. We are using for parallel development of apps that help support our emerging Events business. It has great inventory management applicability as well as process flow, allowing for a relatively quick win without putting a lot of stress on our IT team. "Vinyl helps create order out of chaos"
Ease of configuration - able to get a proof of concept up quickly and iterate on a working product. It is a great platform to take processes that are manual / spreadsheet based / have no home and create structure. Because it is flexible and can connect to multiple data sources with light integration, the Vinyl platform is like a blank piece of paper - each app can have a completely different look / feel / purpose. In addition, the Vinyl team is very responsive to suggestions regarding the product roadmap. As one of Vinyl's first customers, there were enhancements to the platform that we needed in order to drive adoption and they worked with us to deploy important features rapidly. A very nimble team and platform. While improving, there is still some work do be done on UI customization - but as a young product that is to be expected. Get buy-in from your internal IT team early - get them involved / trained to work alongside the Vinyl team while building early apps. Building the in-house knowledge will help the platform be more cost-effective in the long run. Our ratio of software / services expense is about 25%/75% - the license cost is very reasonable, and once our internal teams are up to speed the services expense will be dramatically reduced. The two apps that we have built in Vinyl have helped us to build process / transparency into very manual processes that span our enterprise. Business processes tracked in spreadsheets or google docs are now available in Vinyl, accessible to anyone in the enterprise through our SSO - so security is easy to manage and we have all of the underlying data in one place. We have been able to add a level of transparency that we didn't have, and increase the level of collaboration between teams in order to gain efficiency and provide better data for senior management to make decisions. "Powerful, Dynamic and Constantly Improving"
The software is already robust and extremely functional and continues to get better with each release. The Zudy development team is constantly making features bigger, faster and easier to use. The capabilities of Vinyl seem to be endless. I think setting up pages to look more modern is a little bit of a challenge. However, with a little help from HTML and CSS tutorials this can be done. Vinyl offers a great platform to handle any business problem you throw at it. It has the ability to interact with a variety of data sources. This along with the ability to easily stand up web pages makes Vinyl a great resource for web based applications. Vinyl offers many features to help solve a wide variety of business problems. It allows you to collect and show data across many different systems and provides you an easy way to show that data on a page. It also allows for easy API's setup with the ability to incorporate those endpoints into any action in Vinyl. "Hit the ground running with data driven enterprise applications!" The platform is really a "no code" platform. Once you really begin working with it, you will see that Vinyl adopts many SQL based concepts. If you are familiar with working with SQL (regardless of what flavor of SQL), you will have a very easy time creating simple enterprise class apps. I also like that Vinyl can work with many different data sources, and the SQL abstraction works for non-SQL data sources, such as web services. I've been very satisfied with the product and service we have received from Zudy, Overall, our team yet to find something to dislike and Zudy has been helpful to answer any questions we have posed. Great customer support. Training was included in purchase. Frequent product update cycle regularly delivers new features. Vinyl does a great job replacing homegrown MS Office databases and spreadsheets that various business units have created over the years. Getting this data out of *.docx and *.xlsx files and into applications that other departments can use and report on is a great use case. "Extremely powerful, but not without its limitations." The ability to build tables and do complex joins much faster than hard-coding them myself in SQL. A close second would be the Vinyl's ability to handle building the app's GUI more or less on its own; being able to focus on functionality and not have to worry (as much) about how it looks saves a great deal of time. Inflexible at times ("no code" really means "no code," so if what you're trying to do isn't a built-in feature, you're more or less out of luck), UI customization limited so aesthetics often look similar from app to app. It also has a relatively steep learning curve -- hence my lower grade for "ease of use" -- so it takes a while to get used to all of its little quirks and idiosyncrasies. We've used Vinyl to solve a wide array of business problems in myriad industries. Everything from talent management, to suit fitting, to internal communications and reporting apps have been built with Vinyl. As for the benefits I've realized, the biggest thing has to be extremely quick delivery. Everything from building a POC, to fixing a bug, to delivering an app to prod happens on a much faster schedule than usual. "The way enterprise software should work"
Light integration, speed of development, ability to customize but still have a consistent UEX. Vinyl doesn't replace your existing systems, it makes them 10 times better while allow you to build your own apps and create a competitive advantage. There are a handful of UI features I'd like that to have. These reflect UEX features I've seen on consumer apps. But with a new release of Vinyl every 6 weeks, I'm sure those items will come quick! Get in now before the company get's too big to hear your specific feature requests. All the features come from customers. I think Zudy will have 100 customers in 2 or 3 years. We solve many business needs with Vinyl. Vinyl let's us define how we want to run our business then use Vinyl to enforce that business process. We are also able to deliver a consistent user experience to our end users. We tackled a number of challenges: CRM, HR, BI reporting, event and workforce management. "Great Information, Quick Set up"
The adaptation of Vinyl to our environment has been quick and easy. The Zudy team has been very proactive and responsive in listening to our requirements and meeting our requests. Our old financial reporting process was very spread sheet heavy and labor intensive to produce. We were able to quickly attach Vinyl to various systems in our environment, apply business logic and significantly speed up and improve our financial reporting processes and delivery. We now have a commercial grade, real time, mobile ready professional looking financial reporting package for our business unit leaders. Our financial reporting team has been given the ability to spend more time performing financial analysis as opposed to pulling together massive and cumbersome spread sheets. the result has been a fresh look at the way we evaluate our financial performance leading us to ask more questions and dig deeper into additional information relationships across multiple systems. The power of the Vinyl platform and the number of opportunities it provides has required us to be more thoughtful about the way we use and develop systems. In order for us to remain focused, we needed to develop and implement a more formal requesting and approval process for development. Make sure you have a strong development process within your organization. We have drastically improved our ability to collect, report and distribute financial information. We look forward to using it in other ares of our business. "Much Better System than the one we had in place"
So far, after using it to the extent that I have there doesn't seem to be any serious issues. At times it runs a little slow on our server but that more than likely is not Vinyl's fault. It's providing us with much better organization when it comes to our endorsement campaigns. We can view what each of our jocks currently is doing for endorsements by a click of a button versus reaching out via email. Everything is recorded and on Vinyl. "Makes Application Development a Breeze." Firstly, the speed at which I can go from the drawing board to a fully-working application is astounding. Vinyl handles OAuth and REST API almost by itself. New features get added all the time. Perhaps the thing I like best is how Vinyl retains a surprising amount of flexibility in how I want an application to function and look. That's quite unusual for a RAD platform. Occasionally I think of a feature that would be useful, but hasn't been added by the development team yet. The entire dev cycle is something like 6 weeks, so I usually don't have to wait too long. Instead of just listening to the sales representatives, try it out for yourself. Really get your hands dirty. Vinyl's advantages will quickly become evident. I've worked on a workforce management system, an inventorying system, an app that interfaces with representatives at a call center, and an app that is used by sales managers for a clothing company in dozens of stores around the country. I'm also using it in a personal project that interfaces with Facebook API. I plan on adding money transfer services such as Paypal/Venmo in the future, which with Vinyl, shouldn't be an issue. "Wonderful features and relatively easy to learn." The object-oriented nature of Vinyl allows for very clean and fast queries on data. Also, the functionality is very complex and thorough, it'll do whatever you need it to as long as you know where to look. Features and options can be hidden or not named intuitively. This adds to the learning curve, but once you understand the naming conventions, it becomes a breeze to learn new features. Spend a lot of time playing with apps even if the features are not something you would necessarily implement. There are a lot of functions within Vinyl that can be tricky to find, but are extremely helpful. Even if they easy to find, proper implementation can be tough. The user manual is very helpful. Connecting to large data sets that are not the best in terms of proper db structure. Vinyl helps to significantly increase the accessibility to the data and create easy to use applications to view and modify the data. Being able to dynamically access data in a user friendly way helps others see the value in the data we collect and increase interest in moving away from an antiquated system. "VINYL is a painless web app development framework, boiled down to the fastest and easiest level." I am a software developer that is currently working with VINYL. Having worked with web frameworks (ROR, Django) in the past, VINYL is very quick to pick up, and you don't need any coding experience to make an app very quickly. That being said, having coding experience could prove helpful to better understand the relational logic and joins going on underneath the framework. Overall, Vinyl is an extremely accessible framework and the speed at which you can build apps is pretty amazing. We've been able to take enterprise-level applications from a wireframe to production in just a few days with the connectors Vinyl offers. Nothing so far. Any problems I've encountered are generally addressed in the next release. Be prepared for a shift in the way development occurs. Vinyl is a departure from traditional code, but the platform is extremely powerful. One person can do the job of a handful of traditional coders. I have built and worked on multiple applications from the ground up using the software that are currently in production at the enterprise level. Having used frameworks like Django and Ruby on Rails in the past, it makes it clearer just how fast and easy app development is when code is abstracted away. The way that VINYL interfaces with data also streamlines the process and makes using data from multiple sources very easy, which is something extremely difficult to do in different dev environments. This has been a true partnership in building the Zudy team was involved in every step and took real time to understand our needs and how the business works, 3rd party vendors do usually take full interest in the business side and have the one size fits all approach, with Zudy this has been very different, at this point they understand our business better than some of our own people do, which makes it much easier to implement changes. The fast deployment of updates and changes was the big surprise, usually any changes or upgrades are long and extensive, with Zudy we are able to move quickly on changes and enhancements. Not much, the idea that we waited too long to adopt this solution. Just give them a little time to show you what they can do, yo will be amazed. With the new system we are solving what before was a long and extensive process in our retail stores with errors and inconsistencies, netting us profit that before we did not realize, this has been and immediate result. "Ability to code for many browsers and many devices in one location with multilple data sources!" The ability to bring up a web based application quickly that will work on multiple browsers and on multiple devices without having to create specific code for different combinations is a life saver! I can focus on creating the best content for the business process and not worry about if my user base is on a phone or a tablet or a desktop computer and if it is a Mac or a PC. The ability to bring together multiple data sources into one application and bring them all to one page as usable information has also proven to be a huge asset. From a programmers perspective in which I am used to writing in code and able to do anything at all, it is a little challenging to understand the interface. But once immersed in the creation process it is just like learning a new language, and it becomes clear and easier to understand. Along with a great product they have outstanding support staff!! The product would not shine as bright without the consulting force. Many manual processes are being rolled into the application and as users see the ease of use and benefit more additional processes are being selected to be integrated into the application. This is creating a streamlining of workflow that was not in place prior to this. Coming from a background with no Computer Science, programing language or database experience I was blown away at how quickly I have been able to learn VINYL to make applications from scratch. I wish that there was an option to view table joins visually with the lines drawn between tables. But, once I was able to learn the correct time/place for each join the need for this feature has kind of gone away. Give VINYL a chance. Let the developers show you what they can do. In my experience, customers are blown away at the speed and versatility of an application as it goes from concept to production. I have used VINYL to build and improve applications in multiple industries including: Men's custom suits, automotive recall, medical recall and insurance. "Vinyl is incredibly fast, powerful, and user-friendly!" Before working with Vinyl I had very limited experience in app development. The speed and power that we gain through using Vinyl has been incredible to witness and be a part of. Even with all of the abilities which vinyl possesses, it remains a simple and straight forward tool to use. Learning to build apps within vinyl has been so much fun and allows for quick and collaborative creations. Sometimes I do get confused with terminology used within vinyl but as I have worked with the tool more it is becoming very simple to understand the language used. Vinyl allows for extremely quick development of complex and customizable applications. I LOVe the flexibility to build apps the way I need them to operate to run my specific business. It seems like issues pop up unexpectedly. I wish there was a way to guarantee a more consistent experience across the chain without the little glitches here and there. I'm no accustomed to dealing with random issues from most of my other business systems. It's definietely a different process but it allows you to custom build exactly what you need for yuor business. Be flexible in your approach and you will ultimately get a much better product than if you purchased something off the shelf. The people make the difference though. The guys we work with are incredible! "Zudy Vinyl is an incredible tool for any business....."
For our business the best feature with Vinyl was the ability for it to talk to different systems and platforms no matter how old or new and pull together data and information into very practical reports and analysis for the management team to use. In addition we've been able to use Vinyl to simply and automate processes internally that make us more efficient and ultimately save money. There is nothing we've encountered about Vinyl that we dislike. The team at Vinyl is highly capable of solving complex business problems you might have or creating applications that can help your business. Given their ability there really very little they can't do to help you with your business and create something that your team will find useful and helpful on a regular basis. We are solving several problems with Vinyl. One of those is reporting of data from multiple locations and in some cases multiple companies to create comprehensive and easy to read and navigate reporting that can be viewed from a computer, smart phone or tablet. Some of the other problems we are solving revolve around creating reporting that can take away the need for our team to manually do certain tasks and create better efficiencies. "Partner and Chief Marketing Officer"
The usability is exceptional. The support you receive from Zudy is top notch. They are easy to do business with and honest, ethical people. Ultimately it is the problems that Zudy resolves for my organization that I like best!! There is nothing about Zudy that I dislike. Even the price was reasonable and something to feel good about. The product does everything they say it can do and more! It is truly a winner!! Our databases are now able to talk to each other. We are able to get at data that was impossible for us to see. We are able to automate static reports that were old the day we received them and required much labor to create and replace them with a live Zudy report that is not old and once built requires no more man power to create. 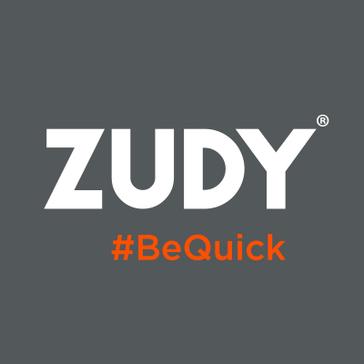 We are making smarter, more informed decisions because of Zudy. That I can send a request once and it goes to multiple managers for approval. I can see if a talent is available before I have to go to the program directors and managers for approval to present the talent. I can search in multiple markets without having to go through the market managers. It is somewhat particular when searching. It will sometimes freeze up and doesn't tell you why. It could be that the talent has a conflict but you can't see that in the section. It can also be hard to tell when submission is complete. There is no verification that the request has been submitted. It just stays on the same page as your submission. And when you go back to say a campaign is sold everyone is notified again, creating some confusion. They think it is some change to the campaign or a new campaign entirely. It is a good platform and I would recommend it for areas requiring the approvals of multiple people and multiple departments. I believe it is in the growing stages and the glitches it has will be addressed in the future. Since there are multiple approvals required before we can present a talent for an endorsement campaign, it became very convoluted and time consuming to make the request of all the necessary people. This makes the endorsement approval process more efficient. Need multiple approvals from separated department sfor an endorser to be approved to present. "Makes the average developer a business hero!" The best part about Vinyl is the simplicity and limited redundancy in development work. Once you write your logic it flows throughout the platform, from making application pages to API endpoints. Very similar to the security model, set it at one level and the platform allows you to easily enable security models down to the record. The lack of flexibility with the UI is hard for a traditional developer, you will have to be more creative. However, the Vinyl development team is quick to respond to necessary changes. We are solving many business problems with Vinyl from Workforce management, Customer Outreach, POS/Sales Reporting, Order Processing and Store Tracking. It enables us to be quick and efficient. I was amazed by Zudy's ability to rapidly deploy value-add applications and communicate with our preexisting ERP system in real-time. This type of application development is a total game changer when it comes to solving everyday business workflow needs. So far, I only have positive things to say. One thing to keep in mind is that it forces you to really understand your business process before you build your application. Overall this is a good thing, but definitely takes some time in terms of understanding what your needs are. Stop thinking about it and start doing it. I like how fast and intuitive it is to use VINYL. My favorite thing, though, is that Zudy is always looking for ways it can improve its technology; this comes with an updated release of VINYL every 3 months. I don't like that Vinyl doesn't allow full use of design elements. I will say, they are working on this. "Building apps to automate business processes in a matter of days!" I have used Vinyl to automate reporting, organize business to customer relationships, and pull data from APIs to enrich the user's experience. The benefit of this is that is can be done much quicker than if I were to hand write all the code and build the environment. Vinyl gives us the flexibility to connect disparate data sources across our enterprise. We can spin up applications in hours, and have them in the hands of our users in days. Previously it would take weeks, months or even years to deploy applications, but not anymore. Some of our business processes complicate our deployment speed. We need to change our testing and infrastructure process so we can move as fast as our application development team can now move. We are tapping into legacy applications, to allow our users to interact with the data in a more meaningful way. The way we built our legacy applications worked 10 years ago, but the business has changed. Vinyl allows us to change, while still retaining our historical data. It has completely revolutionized our business. "Marketing & Community Investment Manager"
The application will allow us to gather complicated information from our customers and portray it in an easy, user friendly manner, overall enhancing user experience. The process to get the app off the ground has been slower than what I expected, but not as a result of Vinyl or Zudy (software provider has been slow to respond). Creating a better user experience and streamlining our internal processes are first priorities. We believe that by using the platform internally when creating new accounts, the process should actually be easier for our staff to use than our current routing software. "No code application development is THE way forward"
I went from an application concept to a fully functional app in only a week. And I didn't have to write a single line of code. When you're coming from a world of heavy computer programming and writing thousands of lines of code to achieve the same results as you can in Vinyl, it's hard to say that there are any downsides. Do it - it will revolutionize your concept of the application development life cycle. We created an application to modernize our user interface, improve the user experience, provide measurable reporting, and streamline our business process. "Excellent solution for navigating complex markets with multiple decision points"
For non-technical person I have struggled to learn the various system layers and design elements, however we have other non-technical personnel (our COO) more dedicated to it who are very rapidly making progress within the system. Working to dramatically simplify the systems our front line personnel are working within as they try to make decisions on care delivery. "VINYL - The Future of Software Development"
VINYL is able to connect with what seems like an endless amount of data sources. The speed to get a feature developed or even an entire app is like nothing else I have ever worked with. Most complaints have been small things, that have been addressed with new updates that come out frequently. VINYL is extremely flexible and we have been able to come up with a solution for almost any problem. Apps have ranged from HR and Finance to even Call Center Management. "Quick solution to a complex and long term problem"
Vinyl platform is super flexible and easy to configure. We were able to build out a tool in a matter of months to help solve a capability gap that we have had in the organization for years. Integration with salesforce and other home grown systems was no issue. Have not encountered anything yes that I dislike about the platform. We have built a tool that manages the inventory and approval process for our entire endorsements business. We now have a system of record in place that provides visibility into inventory, allows for clearing of category conflicts, and enables the entire sales organization to maximize revenue on endorsements. "Vinyl is the future for app dev"
Its agility and speed that allows developers to get the app to the business users hands, with the flexibility to have multiple iterations developed at rapid speeds. Could have more native UI capabilities. Currently need to implement HTML and CSS through templates. Replacing outdated, manual business processes like financial reporting in excel. Benefits realized are time saved in manually developing reports, which allows more time for business user to analyze the data, and reduction in human errors. I like that all Talent bios are in one place and the categories are available to see to avoid conflict. Not being able to closed old endorsements or help sales reps enter endorsements. Pay close attention in the trainings. It can be very difficult to use if you don't know what you are doing. Also, if you are a talent manager, make sure you have plenty of time set aside to set up each talent. Sales reps are able to search for talent and see category conflict. "It's easy to use and very detailed"
no complaints - It's easy to use but not used daily because we are such a small market. We have 5 stations and a total of 6 jocks it's just more convenient to ask them if they want to do an endorsement when we are practically sitting next to each other all day. I can see how this would be beneficial in a larger marketed or advertising in multi markets. It saves time on scheduling meetings. I like the Vinyl platform especially for endorsements. I can see what's sold what's not and I can continue to move at a fast pace. The beginning stages of getting on is a small challenge but over all great tool. * We monitor all VINYL reviews to prevent fraudulent reviews and keep review quality high. We do not post reviews by company employees or direct competitors. Validated reviews require the user to submit a screenshot of the product containing their user ID, in order to verify a user is an actual user of the product.